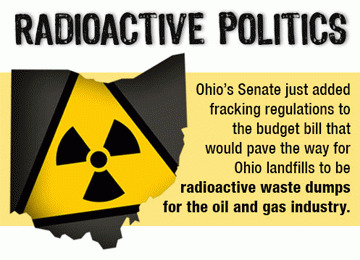 Are our Ohio environmental regulators hiding fracking radioactive contamination? Ohioans were horrified to hear news stories about the spill of toxic material into the Ohio River from a West Virginia coal company. Some of our neighbors to the southeast still cannot drink their water. What most Ohioans have not heard about is the intentional dumping of 20,000 gallons of radioactive and toxic fracking waste water into Ohio's Mahoning River. Three tanker trucks full of so-called "brine" were deliberately pumped into a storm drain leading into the Mahoning on Thursday, January 31, 2013. More than a year later, it is still not clear exactly what chemicals the illegally disposed of waste contained. The presence of radioactivity in the fracking waste could potentially keep Ohioans from drinking water in areas near the Mahoning River for thousands of years. Documents obtained by the Free Press indicate that the Ohio Department of Health (ODH) may be misleading the public regarding the severity of the illegal dumping. The environmental group Stark County Concerned Citizens calls the methods being used to test for radioactivity by the ODH "malicious compliance." ODH testing methods may be a deliberate attempt to mislead the public as to the actual elevated levels of radioactivity threatening people living in fracking area. Fracking radioactivity is the new "Mobile Chernobyl"
(1) Horizontal hydrofracking in Marcellus shale will bring to the surface significant amounts of radioactive wastewater (in the form of both flowback fluid and production brine that flows out of wells during gas production). (2) Processing radioactive chemical laden wastewater through water treatment plants will increase contaminant loads of downstream surface waters. (3) Radioactive sludge from drilling sites or POTWs will contaminate landfills. (4) Vehicles transporting radioactive chemical laden waste (liquid or solid) increase the risk of human exposure and/or contamination of the environment in the event of accidents. (5) Spreading radioactive, chemical-laden wastewater on roads will expose drivers, passengers and pedestrians, and contaminate nearby surface water, land and agricultural fields. (6) Storage of radioactive, chemical laden wastewater in closed containment tanks can result in groundwater and surface water contamination. (7) Natural gas from Marcellus shale contains high levels of radon. Exposure to high levels of radium can cause anemia, teeth problems, cataracts, and increased risk of bone, liver and breast cancer, according to the Agency for Toxic Substances and Disease Registry. Dr. Larysa Dyrszka, a medical doctor from New York who has studied the impact of fracking on public health in that state recently spoke in Columbus about the health risks of fracking. She concluded that "Community and environmental impacts from the public health perspective need attention, especially regarding radioactivity." Ohio regulatory agencies "not looking at that right now"
Ohio environmentalists are concerned that the limited testing by Ohio regulatory agencies is not designed to disclose the actual levels of radioactive contamination in fracking waste. Radium 226, commonly present in fracking wastewater, predominantly emits alpha rays. The standard test for an alpha emitter is to isolate Radium 226 for 21 days to allow its so-called "gamma daughters" to disperse in order to get an accurate measurement of the radioactivity level. For unexplained reasons, ODH documents reveal that tests on the fracking wastewater are using gamma spec methodology. This test design ensures lower levels of Radium 226 will be reported. The use of this methodology appears to be intentionally designed to under-report the amount of radioactive contamination in Ohio. Equally disturbing, when the Stark County Concerned Citizens recently asked the Ohio Environmental Protection Agency (OEPA) for any final results on the illegal dumping in their area, the agency claimed that they had no final test results. The Ohio EPA appears not to have taken a sample large enough to analyze. On January 30, 2014, Richard Bouder, OEPA Public Records Manager, responded to the Stark County Concerned Citizens with an email saying, "I found out that the only test results that we have here at Ohio EPA are the preliminary test results. We do not have the 21-day or final test results. For that information you would need to contact the Ohio Department of Health." They turned then to the ODH, writing its radiation-protection division chief Michael Snee. One of the questions posed, but still unanswered, is whether or not the reported results from the gamma spec test method were still ..."48 times exceeding the legal cutoff for Ohio's 5 pico curie limit?" The Stark County Concerned Citizens also asked the key question: "We request that the Ohio DH fully explain why your lab appears to have failed to nevertheless document the radium results that resulted from the 21-day hold that scientifically allowed for ingrowth/equilibrium of the gamma daughters. Instead, there appears to be only a blank space."